NY Car Parking NY Car Parking Park your car in the marked spot without hitting any obstacles. 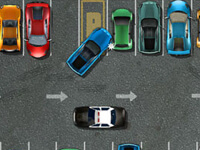 Police Car Parking 3 Police Car Parking 3 Try this new police game and test 3 different cars in 20 parking spots and 10 intense levels. The Green V12 The Green V12 Prove your driving and parking skills in this new car parking challenge. Vintage Car Parking Vintage Car Parking Park like a boss.